Amy Morin’s book really could change your life. We are sometimes our own worst enemies. We procrastinate, we give up without trying, and we tell ourselves that “it could never happen to me.” The “it” in this case is something we want, we deserve, and that’s within our reach. 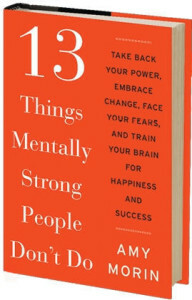 I was really excited to read Amy Morin’s book, “13 Things Mentally Strong People Don’t Do.” I figured that if I followed Amy’s mantras, my life would be simpler and better. Amy, who’s a licensed clinical social worker, college psychology instructor and psychotherapist, signed it this way to me: “Flex your mental muscle,” and heaven knows—I’m trying every day. There’s always more to do. And this book helps get it done. It is working. Thoughts: Identify irrational ones and replace with more realistic thoughts. Behaviors: Behave in a positive manner despite the circumstances. Emotions: Control them so they don’t control you. (Ahem, Stephanie…) In my defense, I am a highly sensitive person, which is another book for another blog. Amy is highly qualified to have written this book. At age 23, her mother died suddenly of a brain aneurysm. Three years later, her husband died of a heart attack. Five years later, the father of her new husband died of aggressive cancer. That third in a set of heartbreaking events prompted her to pen a blog post which bore the title of her book. It also garnered 10 million views online—talk about “going viral”! The book informs us about what not to do when we encounter adversity—and we encounter a lot in a lifetime. It turns the tables and invites us to be happy and successful instead. Of course, none of this happens overnight, but like anything valuable, change requires work and commitment. Take this list and run with it—forward into your life. You will so enjoy what Amy writes about each of these topics, replete with how-to suggestions and valuable life lessons. 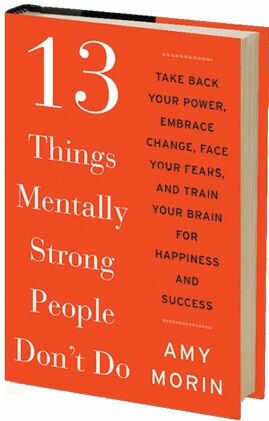 If this list feels comfortable, and your mental muscles are flexing already, go get ’em, tiger!